The film called Shoah runs for more than nine and a half hours. Its subject is the extermination of Europe’s Jews by the Nazis. It features Jewish survivors of the death camps, Poles who lived near the camps, and Germans who organized and ran them—and also its director, Claude Lanzmann, in the background, with his various interpreters. The languages in which these people speak include Yiddish, Hebrew, English, German, Polish, and French: a sound file of Europe. They are also marked by prolonged and terrible silences. There is no music. There is also no archival footage. There are only the voices and the faces of the speakers, combined with contemporary footage by Lanzmann of the sites and surrounding countryside of the camps. It is one of the sternest, strangest, and most important films made in the short history of cinema. It came out in 1985, after around a decade of work by Lanzmann. If you want only the canonical, then here it is: its name is Shoah. But the canonical should not be exempt from curiosity or critique. Or so I began to think as I read Claude Lanzmann’s memoir, which was published in France in 2009 and has now appeared in English. Like the testimonies in Shoah, this memoir is an oral history—but the Paris St. Germain version, dictated to assistants. It follows in digressive fashion the contours of Lanzmann’s life story. And this life rises up to and then falls away from Shoah. He was born to a Jewish family in France in 1925. As a teenager, he fought in the French Resistance. 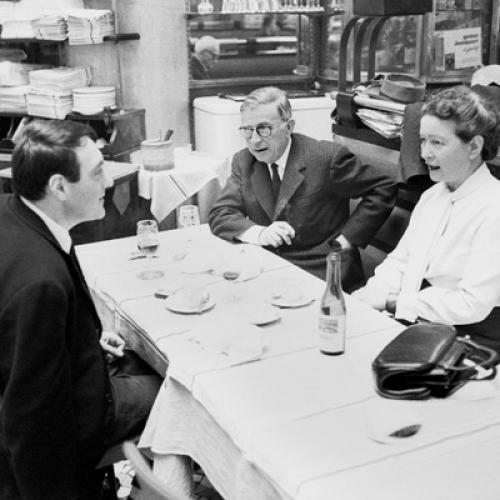 After the war, he became the friend of Jean-Paul Sartre and the lover of Simone de Beauvoir, and eventually he took over the editorship of Les Temps Modernes, the magazine Sartre had founded. He was the absolute copy of a Parisian intellectual: traveling on assignments to North Korea or Algeria, writing for Le Monde and Elle magazine. In 1973, he made a documentary called Pourquoi Israël. And then he made Shoah—which came out when he was sixty. Since then, he has made one more film, Tsahal, on the Israeli army and its defense of Israel. He has also released three more films from the massive archive of unused footage left out of Shoah: A Visitor From the Living, in 1997; Sobibor, Oct. 14, 1943, 4 p.m., in 2001; and, in 2010, The Karski Report. But really he has policed the discussion of Shoah. Shoah forbids many things. Shoah dispossesses people of many things. Shoah is an arid and pure film. But well, I don’t believe this. Shoah, I think, is much wilder than Lanzmann knows. I don’t believe in purity, and I will not be forbidden. The history of the making of Shoah that Lanzmann describes is, no doubt about it, heroic. It took him years: a picaresque pursuit of witnesses, then a prolonged imprisonment in the editing suite. Passionately and remorselessly he persuaded his witnesses to talk: survivors of Auschwitz and Treblinka; Jan Karski, the courier from the Polish government-in-exile to the Allies; Polish peasants who had driven the trains or worked in the fields around the camps and the train tracks: “I was the first person to return to the scene of the crime, to those who had never spoken and, I was beginning to realize, wanted so much to speak, to speak torrentially.” At another point in his memoir he describes Shoah as a “criminal investigation.” And it was—but an investigation that had to proceed, with the criminals, as if it were a eulogy. He invented a new identity for himself, and wrote to surviving Nazis. Most of them refused to talk, but some of them did. He caught them on camera with the use of his “Paluche,” or paw—a camera that he could conceal in a bag. “I had to learn to deceive the deceivers, it was my bounden duty.” In one case he and his team were discovered, and nearly lynched. What was most important was missing: the gas chambers, death in the gas chambers, from which no one had returned to report. The day I realized that this was what was missing, I knew that the subject of the film would be death itself, death rather than survival, a radical contradiction since in a sense it attested to the impossibility of the project I was embarking on: the dead could not speak for the dead.... My film would have to take up the ultimate challenge: take the place of the non-existent images of death in the gas chambers. I worked on these articles in the same way I worked on my films: in-depth research, distancing myself, forgetting myself, entering into the reasons and the madness, the lies and the silences of those I wished to portray or those I was questioning, until I reach a precise, hallucinatory state of hyper-alertness, a state that, to me, is the essence of the imagination. It is the one rule that makes it possible for me to reveal other people’s truth—to flush it out if necessary—to make them real and alive for all time. It is my rule, at least. I consider myself a seer, and I have recommended that anyone who wants to write about cinema integrates this concept of “foreseeing” into their critical arsenal. It is not the wild bravado of this passage— “I consider myself a seer”!—that interests me so much as Lanzmann’s confusion of imagination and truth. Lanzmann seems not to understand the true strangeness of Shoah’s techniques. For it is not, in the end, a film in which the truth values are meticulous. It is more disheveled than that—and its greatness lies in its dishevelment. BUT LANZMANN, like every existentialist, has a mania for the authentic. He wants the pure. In particular, he is intent on figuring his film as the purest form of witness to the Shoah: more precisely, a witness to what was only witnessed by the dead—for no one came out alive from a gas chamber. But one conclusion that began to haunt me as I read his book was that witnessing is a very much disordered concept. It is a mess. The truth is that throughout my whole life, and without a moment’s respite, the evening before an execution (if I was aware of it, as I frequently was during the Algerian War) and the day after in the case of a non-political capital punishment were nights and days of distress during which I compelled myself to anticipate or relive the last moments—the hours, the minutes, the seconds— of the condemned men, regardless of the reasons for the fatal verdict. The witness, for Lanzmann, is in an ecstasy of identification. But this is also a form of narcissism. And also a form of appropriation. Not even a hostage in a taped Islamist execution is safe from Lanzmann’s gaze. (“In the twenty or so ‘films’ I have managed to watch—all of them repulsive—I will retain only one.”) “Just as I took my place in the endless cortège of those guillotined, hanged, shot, garrotted, among all the tortured in the world, so too I am that hostage with the vacant eyes, this man waiting for the blade to fall.” I know, I know: the ideal was always to be engagé. And the theme culminates much later in his memoir, when Lanzmann describes “the role of the witness, which became mine on my first visit to Israel and has constantly grown and reconfirmed itself with time and with each film.” This idea of the witness is a noble ideal. But I cannot quite forget, or bear, Lanzmann’s talent for watching execution videos. Lanzmann’s idea of witnessing is so stained and blurred, and yet he believes that he is pure. The literal hallucination I was gripped by also spread to the protagonists. Just as, in the mirrors of that hair salon in Israel, Bomba would see himself again cutting women’s hair in the Treblinka gas chambers, so Henrik Gawkowski—who, in one of the wagons he drove to the Treblinka station, had probably transported Bomba, his wife and their baby—is completely hallucinating when, under the eye of the camera, he leans out of the window of his engine and looks onto the fifty imaginary wagons he is shunting to the place of death. This is related to Lanzmann’s second, and most important, technique: his careful, patient montage. It is a montage—of voices, of places—that is most evident in relation to the Jewish survivors. Their testimony is nearly always seen over footage of the camps as they were when Lanzmann found them: these burnt out fields and blown-up gas chambers, these persistent railway ramps and station signs. As I had decided there would be not one single word of commentary, the editing of the film is the key to its intelligibility, it is what makes it possible for the story to move forward and the viewer to understand. There is no voiceover to say what is about to happen, to tell the audience what to think, to connect one scene to the next. Such facile expedients, commonplace in what are classically called documentary films, are not permitted in Shoah. This is one of the reasons why the film defies and eludes the categories of documentary or fiction. The editing work was a long, serious, delicate, subtle process. His ideal, Lanzmann writes, was “a single temporality where word reveals itself as image and image as word.” And so it seems important that the original title envisaged by Lanzmann was The Place and the Word. This was Lanzmann’s great invention in Shoah: a miracle of montage, where the past and the present collapse in on each other. But this miracle would not have been possible without his other reliance on re-creation. For the deep motif of this film is the idea of re-living: the speakers are forced to live through once again what they should not have had to live through even once, and they are forced to do it in the name of those who did not manage to survive. The speakers are corpses returned to life. And the viewer is forced in turn to live through what they re-live. In this way, Lanzmann mounted the truth. Through the juxtapositions of his rehearsals and his montages, the silence of the places and the words of the survivors, he witnessed to the history of the dead. How to get a two-meter body into a fifty-centimeter truck? How to dispose of ten tons of arms and legs in a three-ton truck? How to burn a hundred women with only gasoline enough for ten? One would also have to show the typists typing out lists of everything. What would be unbearable would not be the horror aroused by such scenes, but, on the contrary, their perfectly normal and human aspect. An inspired treatment! And this projected film of the Shoah was not an exception in Godard’s thinking. More and more, the Shoah came to represent for Godard the deep absence in cinema’s short history. So that when he started on his great work of archive montage, Histoire(s) du cinéma, it was the absence of the camps—in documentary or in fiction—that stood for the philosophical failure of cinema. Which meant (as Richard Brody describes in his magnificent biography of Godard) that when Shoah appeared, its aesthetic refusal to use archival footage represented a rebuke for Godard, a problem to be solved. It was a problem that has harried his thinking ever since. And the vexed, circling arguments that ensued between the two film-makers center on this question of what true witnessing would be. It centers on the deep question of a truthful representation. When Godard once summed up what separated him from Lanzmann, he invented a neat opposition: Godard was of the party of images, whereas Lanzmann was of the party of words. But I think in fact that Lanzmann’s allegiance is even stranger, and more occluded. There is a difference between Godard and Lanzmann, no doubt. But it isn’t quite in the opposition of words to images. This strangeness emerges, in The Patagonian Hare, in a passage where Lanzmann returns to a show of photos put on in Paris in 2001 called Mémoire des camps. It was curated by Clément Chéroux, and its catalogue included a long essay by the art historian Georges Didi-Huberman, focusing on four photographs. (Didi-Huberman later published this essay, with another long essay on the same theme, as Images malgré tout.) For Lanzmann, this exhibition and its commentary represent a scandal. And the reasons he gives, I think, reveal how the methods of Shoah have since petrified for him into a dogma. LANZMANN’S POLEMIC concerns the presentation of a series of four photographs taken by members of the Auschwitz-Birkenau Sonderkommando, in the summer of 1944, outside Crematorium V. One member, David Szmulewski, kept watch from the roof; while another, a Greek Jew named Alex, whose surname is unknown, took the photos. They are some of the most painful images in history. They are hurried, compositionless, blurred. Two, taken in the shadow of a doorway or opening—the north gas chamber, according to Didi-Huberman—show members of the Sonderkommando sorting through a heap of dead bodies, in front of the smoke from the incineration trenches. A third photo shows a group of naked women either waiting or walking, with trees in the background. The fourth, evidently the most hurried, is an almost abstract photo of trees. There are many who ... demand images. After the release of Steven Spielberg’s Schindler’s List, and in order to testify, by a reductio ad absurdum, to the uncompromising stance of Shoah, I observed that if I had discovered a hypothetical silent film shot by an SS officer showing the deaths of 3,000 people in a gas chamber, not only would I have not included it in my film, I would have destroyed it. But I am not so sure about Lanzmann’s refusal of the image—just as I find myself feeling uncertain when he later flourishes his “paradox” of Auschwitz: “No one was in Auschwitz!” It is not, in fact, a paradox. It is only an exaggeration. He means that Auschwitz was an anomaly among the death camps and the labor camps, since usually the two forms were separate, whereas Auschwitz combined a death camp, from which no one returned, with a labor camp, from which some people returned—but therefore they were not present at the deepest evil of the camp, the gas chambers. To paraphrase Lanzmann in his own crude way: if you can remember Auschwitz, then you were not really there. We, the survivors, are not the true witnesses.... We survivors are not only an exiguous but also an anomalous minority: we are those who by their prevarications or abilities or good luck did not touch bottom. Those who did so, those who saw the Gorgon, have not returned to tell about it or have returned mute, but they are the “Muslims,” the submerged, the complete witnesses, the ones whose deposition would have a general significance. They are the rule, we are the exception. In The Drowned and the Saved, this split is the form of Levi’s ongoing moral examination: how to witness for those who are absent. It encompasses a double fear: the fear that one will not be heard or believed (the Nazi regime loved taunting its victims with this possibility, that the suffering they had invented was so exceptional in world history that it would be unimaginable, and unbelievable, for those who had not experienced it), and the fear that one is not morally worthy of witnessing for the dead, haunted by the possibility that those who survived only did so by inhabiting a moral “gray zone,” which those who died never entered. The split is the form of Levi’s patient, luminous, tender prose. In Lanzmann, however, it is a form of mysticism, of the metaphysical. Lanzmann is committed to the purity of the unknowable. What is knowledge? What can information about a horror, a literally unheard-of one, mean to the human brain, which is unprepared to receive it because it concerns a crime that is without precedent in the history of humanity? Whatever one may say, once Hitler’s war against the Jews had begun, the majority of Jews could not have been saved. That is the tragic side of history, which forbids retrospective illusions that overlook the depth, the weight, of the illegibility of an epoch, the true configuration of the impossible. Raymond Aron, who had fled to London, was asked whether he knew what was happening at that time in the East. He answered: I knew, but I didn’t believe it, and because I didn’t believe it, I didn’t know. While I share Lanzmann’s dislike of retrospective moral judgments, there is still something disturbingly grand in this paragraph, disturbingly clean. And the hidden distortion of Lanzmann’s thinking distorts Aron’s words. During the war, the philosopher Raymond Aron was among the Free French forces in London. In his Mémoires, Aron sadly asks himself what he and his colleagues knew about the genocide, from their position in London. They knew, he wrote, that there were concentration camps, which were cruel, and where the mortality rate was high—but as for “the gas chambers, the industrial assassination of human beings”: “no, I admit, I did not imagine them, and because I couldn’t imagine them, I didn’t know about them.” This formulation is crucially different from Lanzmann. Lanzmann’s Aron is informed, but mute before the inconceivable, whereas the real Aron’s words are different: they say that because he did not have the information, it did not occur to him to imagine anything else. Once again, the problem is in that word imagination. In the ruins of the war, a form of early and destitute postmodernism emerged in Europe and America. According to this teaching, all representations are failures. The Shoah became the pure example of such a failure. No representation in word or image—so ran the orthodoxy—can ever be commensurate with the Shoah’s enormity in the history of crime, or the history of suffering. It is beyond expression. It is the sublime. And so at the center of any representation of the Shoah must be absence: incommunicability. For the truth is unknowable. And this is Lanzmann’s position. The truth was known only by the murdered. Yes, this is Lanzmann’s position—the hypostatization of his film’s particular methods, its refusal of the twin temptations of fiction and the archive. And this is where I think that Lanzmann is wrong. LANZMANN’S ARGUMENT is that Shoah represents a pure refusal of the image: no other form could be equal to the absolute Nothing that was the gas chamber. The experience, in its essence, was incommunicable. But the problem with this is the evidence in Shoah itself—the descriptions, say, of the former member of a Sonderkommando, Filip Müller, describing the bodies in the chamber after they have been gassed, these bodies massed together like a block of basalt. Or the buried testimony, such as the chronicles of the Łódź and Warsaw Ghettos; or the statements of the Sonderkommandos themselves, buried underneath the crematoria. To make of Auschwitz a reality entirely separated from the image or from language is only to confirm the hell feared by Levi: that no witnessing will be heard. But Levi himself stands as the great example of how it is still possible, among the living, to witness for the dead. The “dead could not speak for the dead,” wrote Lanzmann. This is obviously true, as a tautology. Yet the living can still speak for them. Otherwise what would mourning mean? So I prefer the calm irony of Levi, who himself described how this postmodern sublime took hold in the 1970s: “According to a theory fashionable during those years, which to me seems frivolous and irritating, ‘incommunicability’ supposedly was an unfailing ingredient, a life sentence included in the human condition.... It seems to me that this lament originates in mental laziness and points to it; certainly it encourages it.” And yes, the idea of the unimaginable recurs among the speakers in Shoah (a peasant from Treblinka saying: “It’s inconceivable, you can’t understand it”; or Jan Karski describing the Ghetto: “It wasn’t a world”), but this is only a form of speech. It seems important to be as prosaic as possible, and to be very calm. The Shoah was not a mystical experience. It was a massive, complicated sequence of minute events, some of which were crimes, some of which were collaborations in crimes, some of which were simple failures of thinking. It was not only the deaths in the gas chambers. It was also a day in the Warsaw Ghetto, or the shootings at Babi Yar, or a man hiding under the floorboards of his own apartment for four years. It was the killing of one’s pet because one was being blackmailed by one’s neighbors. Yes, it seems important to be very prosaic. And this multiple event can be described with a vast array of possible representations, so that just the permutations of film and writing would comprise, let’s say, contemporary documentary footage, and subsequent documentary footage, and feature films; and then fiction written by Jewish survivors, or by non-Jewish survivors, or by Jewish non-survivors, or by non-Jewish non-survivors; and reportage, such as contemporary diaries, or reports by journalists such as Vasily Grossman, who was present at the liberation of Treblinka, and subsequent memoirs. And so on, and so on, into the infinite distance. Sure, none of these representations can offer the whole. But then the whole of anything is never said. The dream of the total is a category mistake, a form of hysteria. For all reality, in the language of theory, is pluri-dimensional and so escapes its representation in the flatter surfaces of images or words; but since this is infinitely true, it is also irrelevant. The camp was a laboratory for destroying the individual. It was a place where the Nazi system tried to destroy the idea of the human, by refusing to accord the status of human to its victims. And therefore the sternest form of resistance was to refuse this. This is beyond the problem of dignity, or self-respect. It is as if, to put this as bleakly as possible, even people, in the end, will have to be anthropomorphized. And the first and deepest lesson of the Shoah is this lesson in the possible. EVER SINCE KIERKEGAARD and Nietzsche, the grand and modern wish has been for a separation of the aesthetic and the ethical. It is hard not to fall for this tradition. (I have always loved Thomas De Quincey’s great essay “On Murder Considered as One of the Fine Arts”: “Enough has been given to morality; now comes the turn of Taste and the Fine Arts.”) But the intricate problems of representing the Shoah demonstrate, I think, that this modern wish is impossible. For these problems are not specific to the Shoah. They show that questions of guilt will still be central to any aesthetics. In thinking about the Shoah, this is called the problem of witnessing. And this itself centers, in its last spiral, on how to witness for the Muselmänner, Levi’s “Muslims,” the most abject of the victims in the camps. For the Muselmann—the camp victim who is physically broken, always on the point of death by exhaustion or starvation, unable to make the minute effort of survival—represented the ultimate form of destitution, the human reduced to speechlessness. This is why the philosopher Giorgio Agamben can write that “the Muselmann ... is the guard on the threshold of a new ethics, an ethics of a form of life that begins where dignity ends.” And it is also, I think, why the Muselmann is the guard on the threshold of a new representation. In his Nobel address, the Hungarian novelist Imre Kertész talked about his great novel Fatelessness, whose hero, like Kertész, is sent as a teenager to Auschwitz. He defends the dead drabness of his structure by observing that his hero “must waste away in the dismal trap of linearity and cannot free himself from miserable details. Instead of a spectacular succession of great tragic moments, he must live the whole, which is a burden and which offers little variety, like life.” But it was this linearity of detail, he continued, that permitted him his novel’s discoveries. After all, “linearity demands that every situation is completed fully.” You cannot even skip twenty minutes—like the twenty minutes his hero spends on the ramp at Birkenau while waiting for the selection. And so Kertész—prompted by the contemplation of a story by another survivor, Tadeusz Borowski, and by photos taken by the SS—is forced into his scandalous precision of memory: where the ramp is not a place of manic fear, but of relaxed and sunlit cooperation. WHEN I READ THIS, I think of the famous final shot of Shoah, of a train approaching the camera and sliding away, like the very first movie ever made, by the Lumière Brothers. Because maybe every future art work will have to be an Auschwitz work. It cannot be anything else. It will have to rethink the idea of the possible, and the metaphysical, and the limits of the sayable. It will have to refuse the dogma of the incommunicable. And so it will have to refuse the prohibitions of Shoah. It will go beyond the myth of a single solution of how to show and how to tell—back into the mess of document and fiction, images and words, literature and cinema. Why should there be any limits? Those who praise Lanzmann’s film often see it as a pure essence of the word, a testimony to human speech, a total refusal of the image. But really its force is in the careful montage of words with images. It is a work of words and images which doubts both words and images. It trusts only in their combination. As I read The Patagonian Hare, this memoir of passionate self-contemplation, I could not forget another great work on or from the Shoah, the Yugoslav novelist Danilo Kiš’s novel Hourglass. Kiš was half-Jewish, and his father was murdered in Auschwitz. His novel is an occluded memorial for his father. It circles closer and closer around a moment in the life of a man who is on the verge of being deported, around a letter sent to his family. And then finally, at the novel’s end, Kiš simply shows the reader the letter. He combines, in other words, a method of oblique approach with a documentary method. And the effect of this montage, in Kiš’s short novel, is to say everything. It is possible, perhaps, to say everything, but only by not quite saying it, by half-saying it. And this put me in mind again of the dispute between Godard and Lanzmann, this dispute about the status of images. In Histoire(s) du cinéma and Shoah, both of them created monuments of montage: it was just that the idea of montage in each is very different. Montage is a multiple technique. And montage, I began to think, as I went back to work, a junior European and Jewish novelist, is maybe one possibility for future investigations: for the future novel, or the future film. You want to say everything? Then you need to learn how to edit and invent the murdered parts. Adam Thirlwell is the author, most recently, of The Escape (Picador).This article appeared in the May 10, 2012 issue of the magazine.